I decided to separate the games, puzzles and other fun stuff from the previous Halloween Bundle to create an item that is perfect for any level. Halloween Games, Puzzles and More is made up of a word search activity, a crossword puzzle, a maze, jokes and riddles, Halloween themed expressions and idioms, a list of common fears, and a few information-based texts for students to read and demonstrate comprehension. One of the coolest parts of this package is a story that you can read to your students while having them do a little découpage each step of the way. 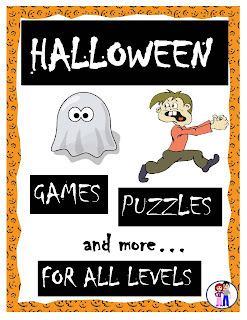 Halloween Games Puzzles and more... is an activity package that is perfect for keeping students occupied and still learning during the rambunctious week which precedes Halloween.